In the modern bathroom you have one of three options for showering – a shower enclosure, which has a shower door and panels along with a shower tray, a wet room, which has a screen or may not have any screen at all depending on the bathroom, and a walk in shower. The walk in shower has a shower screen along with a tray, or there may be no tray. Both a walk in shower and a wet room provide a stylish solution to your bathroom needs. They are modern and smart, and both provide many advantages. But which one should you choose? Walk In Shower Enclosures have trays that help to minimise water spillage and keep the water in one place. This makes them more convenient than wet rooms because you do not have to worry about installing special drainage. Another benefit of a walk in shower, over a wet room, is therefore that you can install the shower in a shorter amount of time. It is easier to install and cheaper. If you are on a tight budget and you want to get a shower into your bathroom quickly, a walk in shower is the best option over a wet room. And talking of cost, a walk in shower will be cheaper to install than a wet room. The walk in shower gives you more space, and you still have the benefits of a stylish look, but the cost is significantly lower. Shower trays for the walk in shower last a long time, and you are not likely to encounter many maintenance problems. The wet room does certainly look more streamlined and is more eye-catching than a walk in shower. If the look of a wet room suits you, you are unlikely to be happy with a walk in shower. You get a lot of space, too, in a wet room. This is one of the main reasons why people install wet rooms – you are missing the limits of a shower stall, making bathing a highly luxurious experience. Putting in a wet room in the en-suite or the second bathroom in the house can increase the value of your home, so long as the installation is completed to a high standard and the products used are high quality. 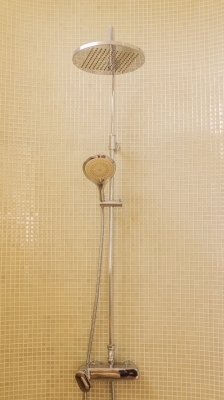 A wet room is easier to clean than any type of shower enclosure. You have more space to move around and there are fewer tight corners that collect dirt and bacteria. And if you have a tiny bathroom then the wet room gets rid of the problem of fitting in a shower cubicle. Simply take out the bath and use the space for an open or semi-enclosed showering area.